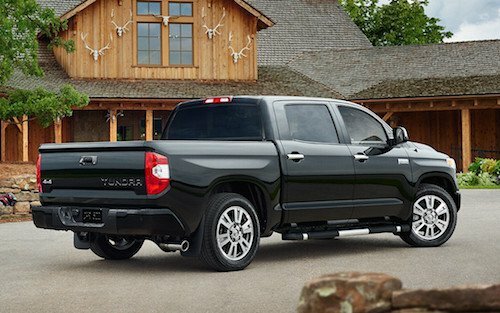 If it is time to upgrade to a dependable new truck, come see the Toyota Tundra in Laconia, NH. With plenty of horsepower, maximum towing capacity and abundant cargo space, the Tundra is one of the most popular trucks on the market. The Toyota Tundra is available as a SR, SR5, Limited, Platinum, 1794 Edition or TRD Pro model. Check out our entire truck inventory online and compare MSRP, trim options and vehicle details. For those on a budget, there are quite a few used trucks, including the Tundra, frequently available. Auto financing is available in our Toyota finance center. We will explain all of the options for buying or leasing a new Tundra or financing a used truck. Our Toyota experts can also help you find special offers and factory incentives so you will be sure you get our very best price and reduced monthly payments. We hope that you will stop by, meet the team and test drive a Toyota Tundra in Laconia, New Hampshire.